Major updating May 27-29; May 31. New artwork added Aug 2, 2013. Vizetelly passage added May 26, 2015. 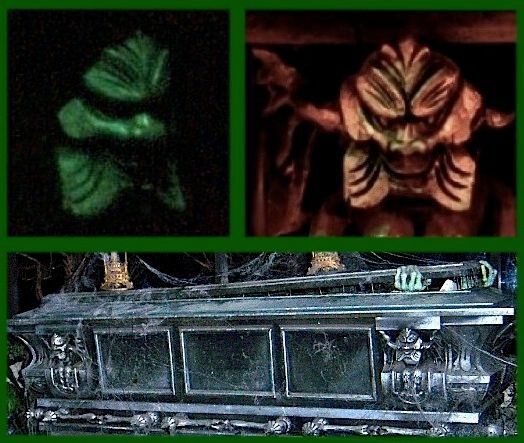 We've done a lot of posts exploring the historical, literary, cinematic, and even musical roots of things that go bump in the night at the Haunted Mansion. There are some phantoms, however, that originate not in events or figures from the past but in universal psychological experiences. There is still a history to look at, but in these cases history is used to show that those experiences are indeed common to most or all of us and have been around for a long time. Today we're all about resurrecting and exploiting childhood fears. Hey, why not? That's as good a way as any to give folks the willies. 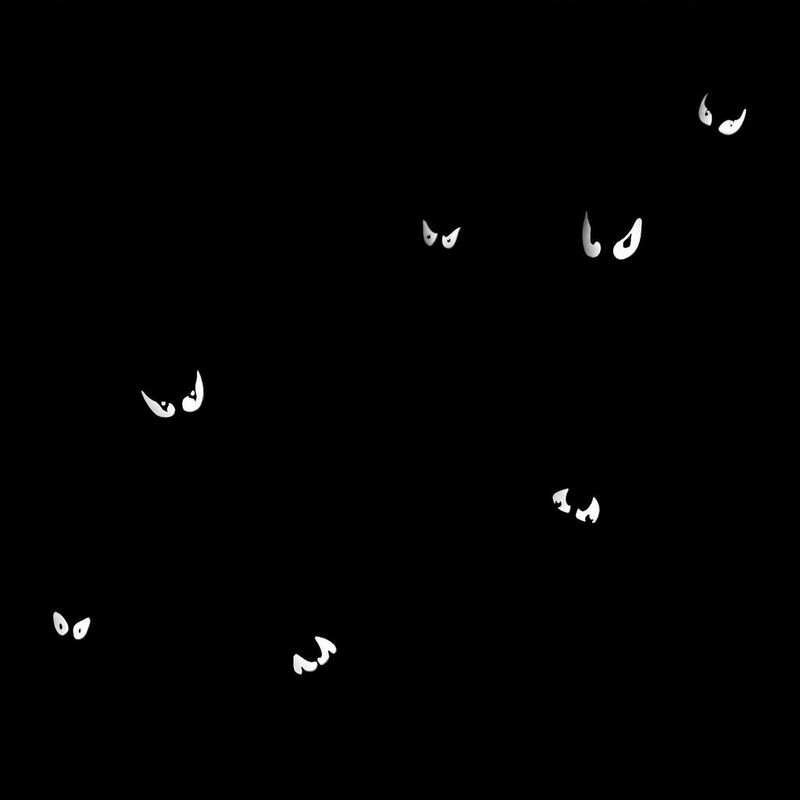 Specifically, we're going to look at scary faces seen in abstract or semi-abstract patterns, the sorts of patterns used to decorate walls and furniture. I wasn't going to devote a whole post to what seems like an extremely narrow topic, but Craig Conley, bless 'im, discovered this gem and brought it to my attention. It's from the November 1904 edition of Good Housekeeping magazine. It proves that exactly this sort of childhood terror is nothing new. 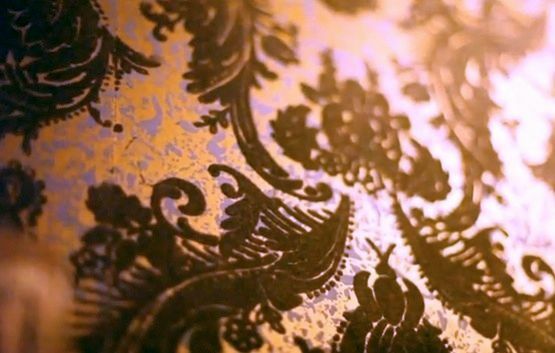 "The wall-papers in many private houses and hotels are remarkable for their hideous patterns, which, in the case of nervous individuals are sufficient to induce an attack of nightmare. These papers are bad enough in the daytime, but at night—lighted perhaps by a trembling moonray—they assume a ghastly aspect. Great ogres' heads, with eyes as large as saucers, and mouths which seem to open wider and wider every minute, appear to stare down upon one; serpents twist and twirl in endless arabesques, as though about to spring; while little demons perch themselves here and there round the room with hideous grins stereotyped upon their features. No wonder that a stranger, with the indigestible Berlin cuisine lying heavily on his chest, should imagine himself encompassed by all manner of horrors, and engage in a more or less desperate struggle with the spirits of the air, in the course of which the hateful bag of feathers is certain to overbalance itself and topple to the ground, leaving him shivering in a half-sleeping, half-waking state during the remainer of the night." It's hard to know how far back we can trace this particular bogey. I suppose that when the fires burned low and the shadows of night took over, cavekids used to shiver at the sight of knarly old trees turning into monsters, but if we want to stay indoors and talk about childhood terror triggered specifically by patterns in walls and furniture, I suppose we have to wait until the emergence of cheap, mass produced, decorative detailing. Before that, wall devils would have been a luxury known only to the lucky few, the children of the rich and powerful. If only he had been born a few generations further back, that unlucky kid in our cartoon would have been sleeping soundly. Flash forward a century and we see that nothing has changed. For a 1989 exploration of this theme, there's a dandy episode of the New Twilight Zone, "Something in the Walls." It's yet another version of that hoary old horror cliché: a supposedly crazy person's hallucinations turn out to be real. But it's well written and refers to precisely the type of childhood fear we see above. Eerie faces that show up in wallpaper show up in highbrow literature as well. In 1892, Charlotte Perkins Gilman published "The Yellow Wallpaper", a novella now considered something of a classic. In it, an intelligent Victorian-era woman suffering from what looks like a pretty normal case of postpartum depression is confined to a room and deprived of any stimulation like books or artwork, deprived even of her child, so that she may "calm down" and recover from "temporary nervous depression—a slight hysterical tendency." Rather than improve, she goes from bad to worse. 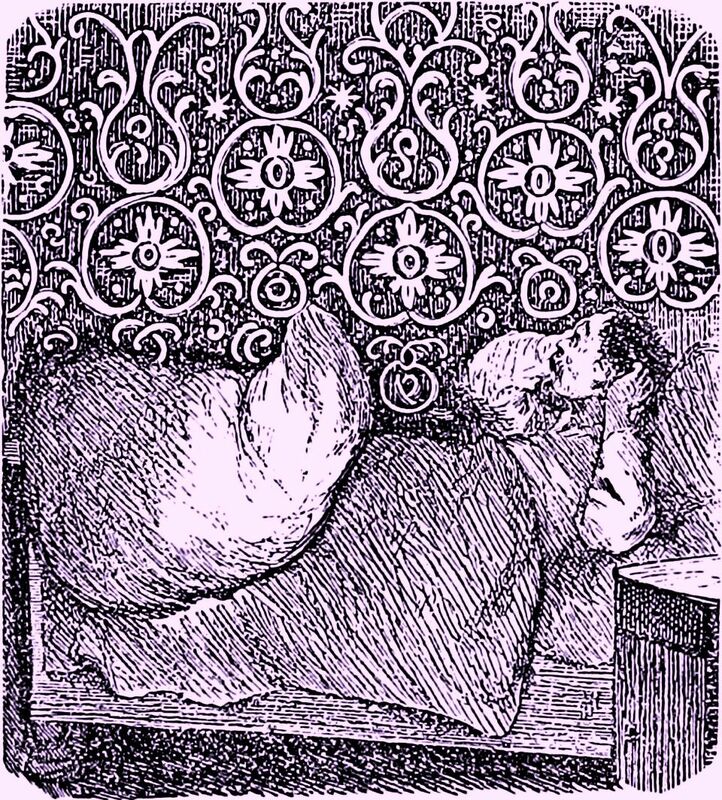 She becomes obsessed with the yellow wallpaper and begins to hallucinate, eventually descending into full psychosis. 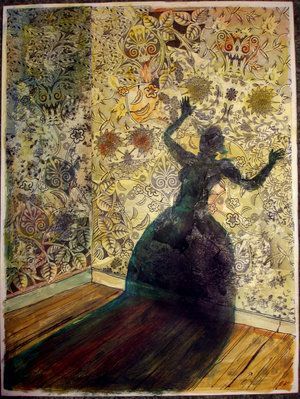 "The Yellow Wallpaper" has often been interpreted as an angry feminist protest against Victorian attitudes toward women, as it most certainly is in the excellent 1986 BBC production for Masterpiece Theatre. The creepy atmosphere of growing madness is palpable, and there is one particularly horrific moment. Gilman's own interpretation, however, was more prosaic: She had undergone a similar treatment for her own depression and had averted a mental breakdown by violating the two-hours-per-day restriction on her writing and drawing. She hoped her story would convince her physician of the folly of his asinine "rest cure." It is also the case that "The Yellow Wallpaper" has been classified and anthologized as first and foremost a crackin' good tale of terror, almost a ghost story. None of these interpretations excludes any of the others, of course. going back to the 19th century, and no doubt more examples could be found. Yoo hoo, readers. *waves* I've got a question. 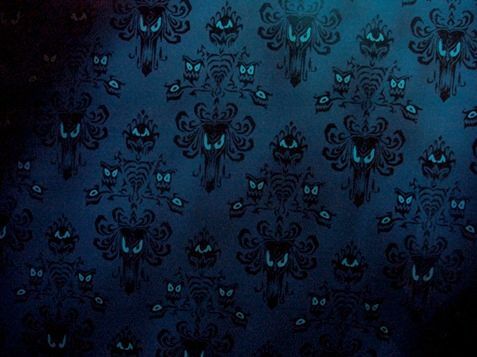 Is there anyone out there who did not find faces in the dining room wallpaper (or wherever it was) when they were little? It wasn't always scary stuff, of course. 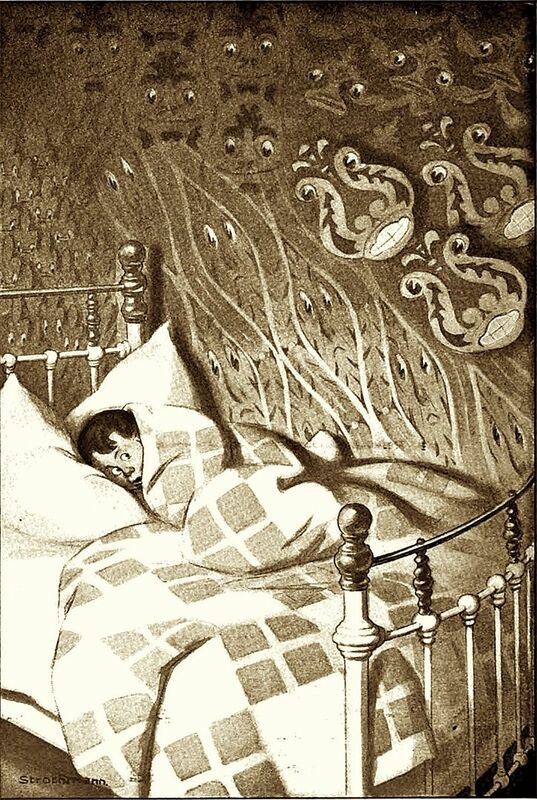 When you were at somebody's house as company and you were put on your Best Behavior and had to sit there silent and fidgetless while the grownups droned on and on about the most boring stuff in the world, what else could you do but find odd creatures in their wallpaper or upholstery? And the ones you had at home, well, those were as familiar as the family pets. Am I right? If we want to understand the actual phenomenon, the psychologist in the New Twilight Zone episode is correct, of course. The brain does try to find meaningful things in abstract patterns. The woman in that episode marvels that faces are what most show up, but that's not really a mystery. The brain always seems to be looking for faces, perhaps going back to infancy's very first search-and-identify mission: recognizing Mom. Here's another curious thing. It seems that a face once discovered can scarcely ever be undiscovered. 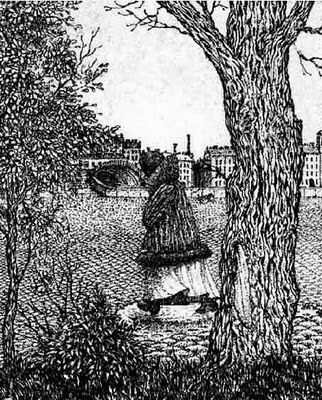 Once you see Jesus in this popular optical illusion, for example, you'll see him immediately every time you look at it again and wonder how you ever could have missed it. As we shall see, this occasionally makes a difference when we look at certain things in the HM. 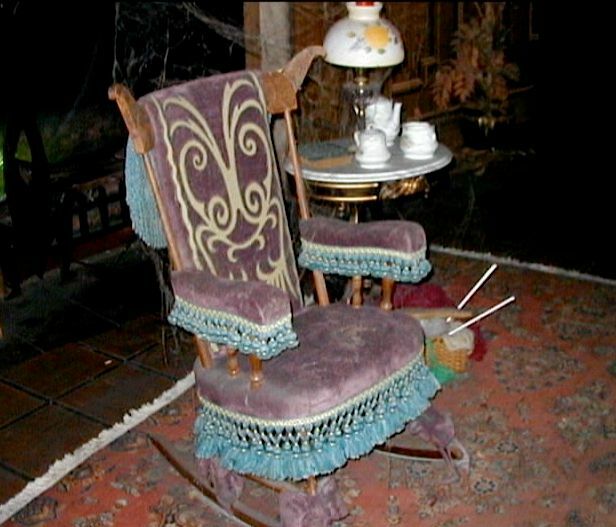 With all of that background, let's go back to the Mansion and to its famous example of the phenomenon we have been discussing. 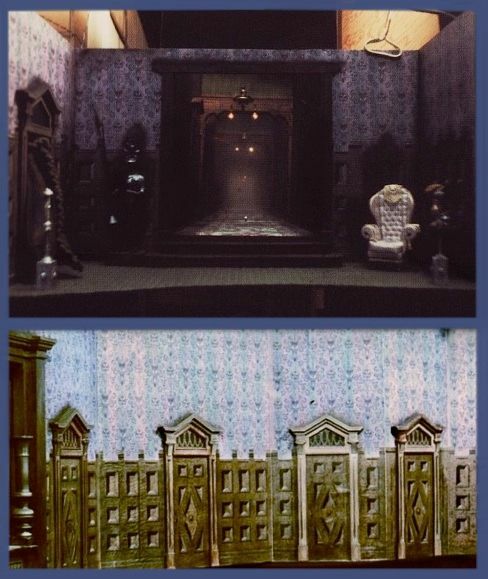 As that older post pointed out, The Haunting was a direct influence on the Haunted Mansion, and the possibility that the wallpaper scene may have served as an inspiration for the demon-eye wallpaper we find in the Corridor of Doors has been suggested more than once. That's still very likely, but as we have now seen, the concept itself is older and part of a broader human experience than The Haunting. 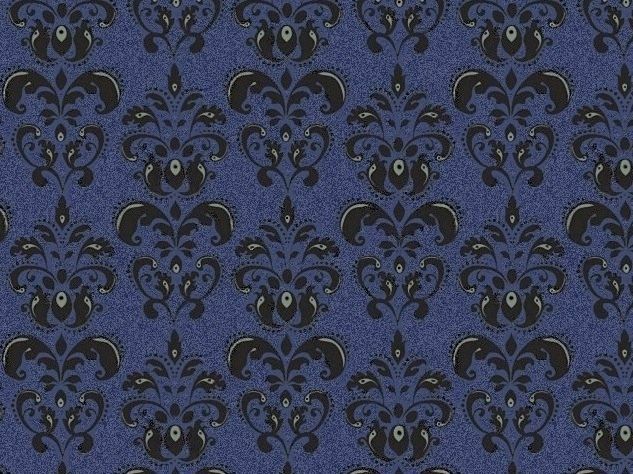 Seems like just about everybody likes that periwinkle paper, and because it has become so familiar, it is easy to forget that it is in fact a sinister parody of something else, of damask wallpaper, which features endlessly repeated clusters of abstract or botanical designs. It is in symmetrical and intricate patterns like these that we are apt to find faces, especially as children. 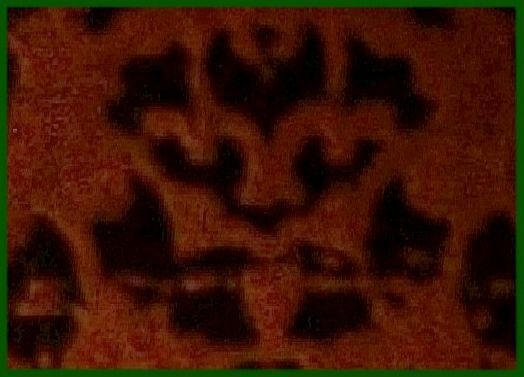 The whole idea of the demon-eye design is to suggest that those faces really were there, and they really were malevolent (or are there and are malevolent). It resurrects and confirms those long-forgotten childhood fears. In short, it plays off of precisely the thing you see in that 1904 cartoon. 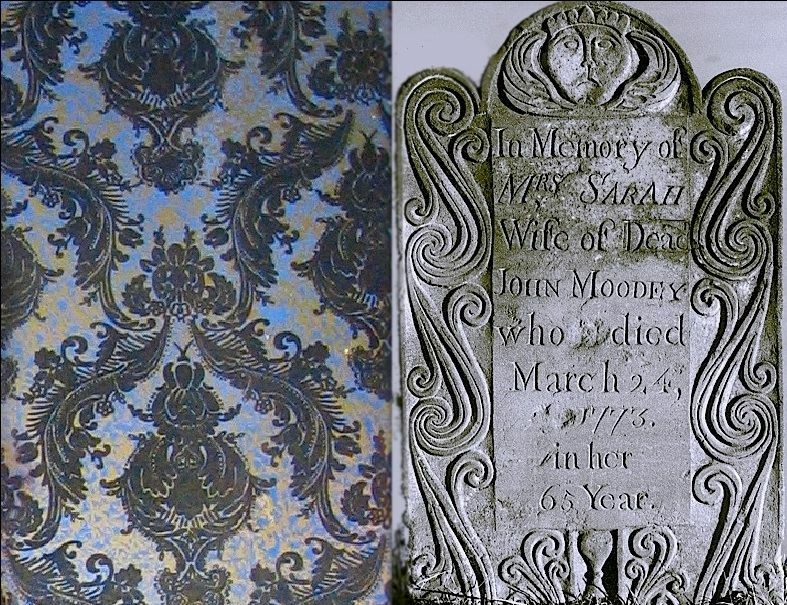 One thing I have noticed in going through scores of damask designs is that they are not all equally amenable to the discovery of hidden faces. Oh, I have no doubt that with perseverance and an active imagination (and boring enough grownup conversation around you) you can find some strange countenances in just about any design; nevertheless, there are some designs that look pretty benign to me, that seem relatively resistant to the paranoid imagination. 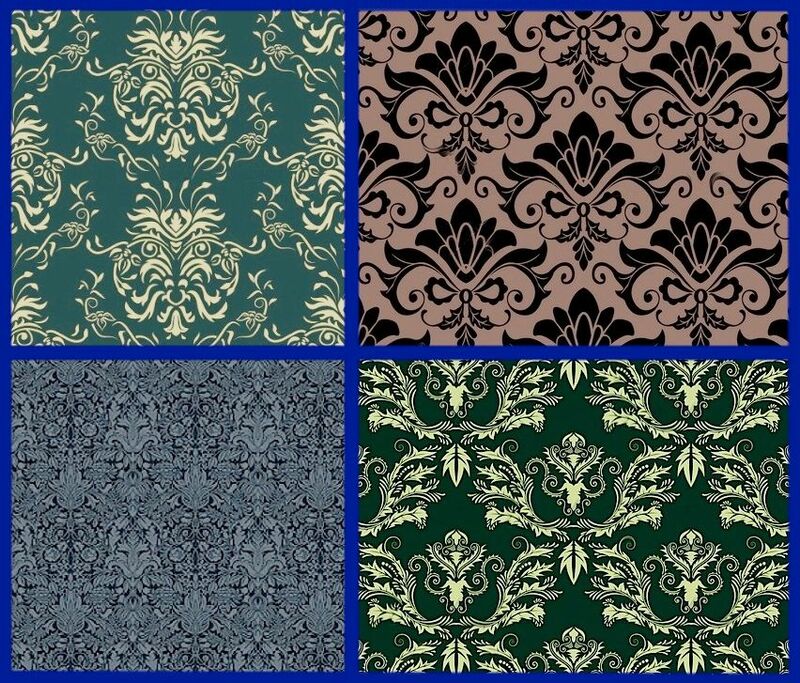 If you insist on a damask design in the nursery, then these, I think, might be acceptable choices. at least I had no trouble—but I imagine that some people may require a little time and effort. artists themselves could have missed the monsters they were creating. 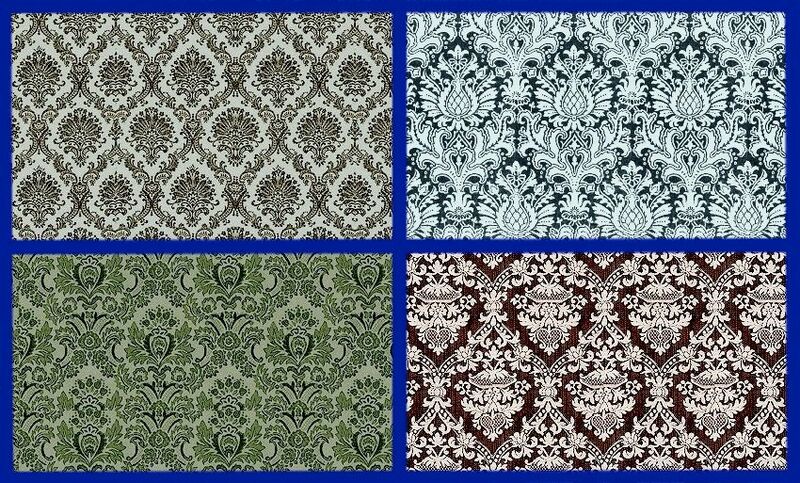 Yes, those are all real, commercially available damask patterns. At least with the blue one, if you look closely, you'll notice that the lion is actually a vegetarian, so that's a relief. I don't know about you, but in the bottom right I see a mad bird of prey. But there's another factor involved. By the time we reach the COD we have learned that the ghosts can manipulate the very fabric of the building, so it is possible that they have distorted the actual designs in their ongoing attempts to frighten and intimidate us, just as the "family portraits" may be hideous distortions of normal portraits. Perhaps the damask was demonized only moments ago, or it may be an illusion, a trick they're playing on you. It's the stretching gallery's "real or imagined?" dilemma, once again. The portraits are not unlike the hideous transformations that flash in the normal paintings downstairs, but unlike those, these never change back to normal. 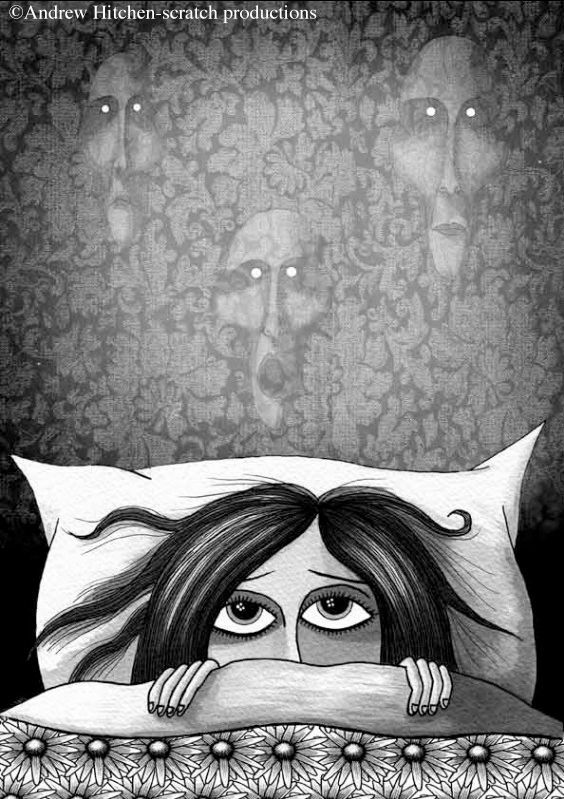 The ghosts are no longer concerned to conceal their presence and are clearly turning up the pressure as we go along. If that is indeed what is happening, storywise, then inquiring minds may wonder if there is a normal, undistorted design on the walls when the ghosts aren't using it to make faces at us. It's sheer fantasy, of course, but all the same it's fun to speculate what the undemonized design would look like. Just for kicks and giggles, I fooled around a little to see if I could imagineer something. 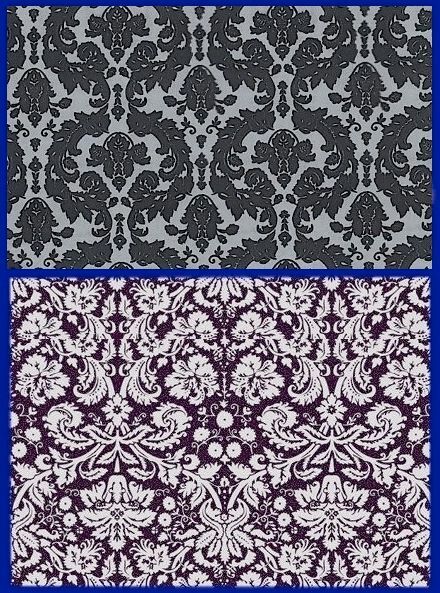 Is it a wallpaper mask of damask wallpaper? It is. 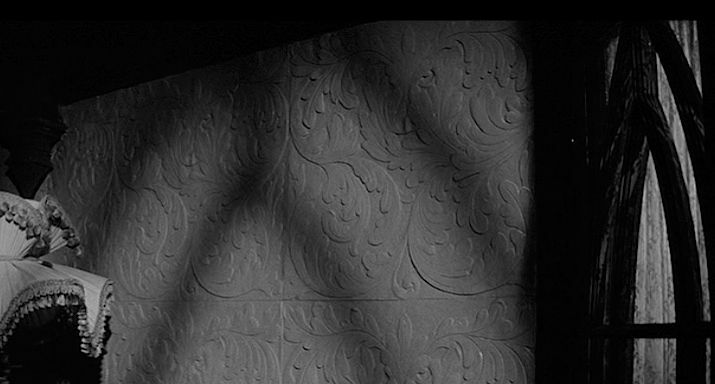 suggestion that the watching ghosts infiltrate the wallpaper design as the walls gradually become visible. The effect is helped along by the fact that the wallpaper eyes glow. I haven't seen the effect in person, but I imagine that when it's operating properly and light levels are correct, it's an impressive illusion. I have to admit that I'm also positively disposed toward it because those eyes in the darkness are a new implementation of an old Yale Gracey effect from 1967. Some of you Eastern folks may not be aware of that fact. 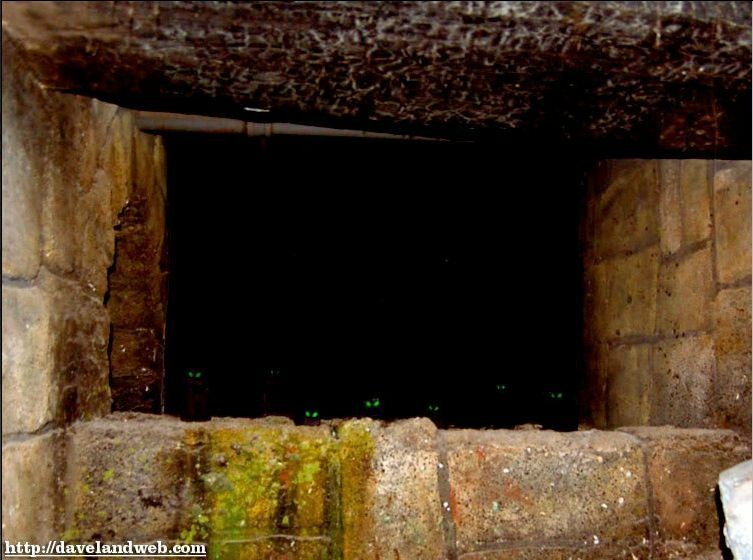 At DL, as the boats ascend the waterfall at the end of Pirates of the Caribbean, there are green rats' eyes winking at you in the darkness on your left. They've always been there. But we're straying off topic here. Let's get back to walls and stares. 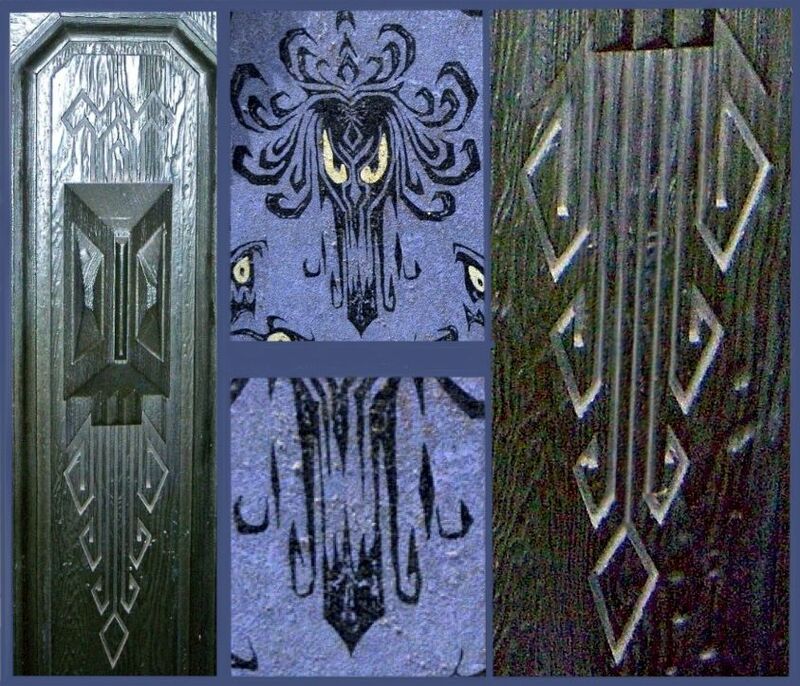 As every HM fan knows, the Imagineers put faces everywhere, in the woodwork, in metalwork, and in upholstery. Like the demon-eye wallpaper, some of these are obviously intentional and hard to miss if you look at them. 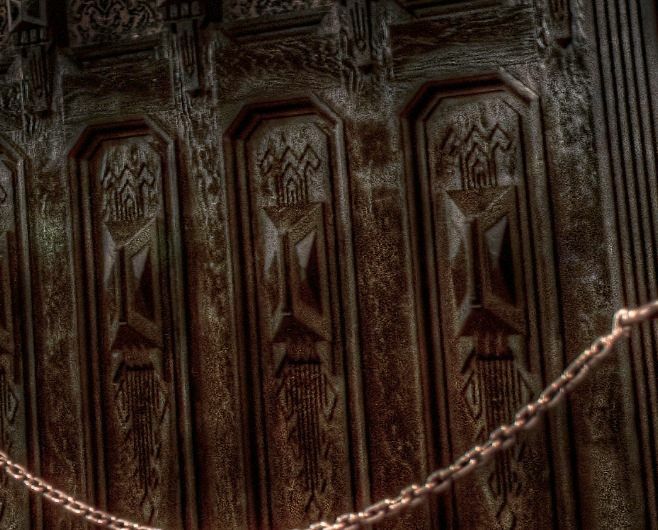 But there are other faces that are so stylized that the Imagineers seem to be deliberately steering you into a fogbank, a place where you're not quite sure if the face you see is "really there" or if your imagination is starting to detect ghostly manifestations in perfectly innocent patterns. I think that's exactly the sort of paranoia they hope to inspire, as part of the overall experience. Are those sad faces on the triangular tapestries below the coffin really there, or are you imagining them? Hmm. They're probably "real," but ask me again tomorrow. The point is, they're that much creepier for the ambiguity. 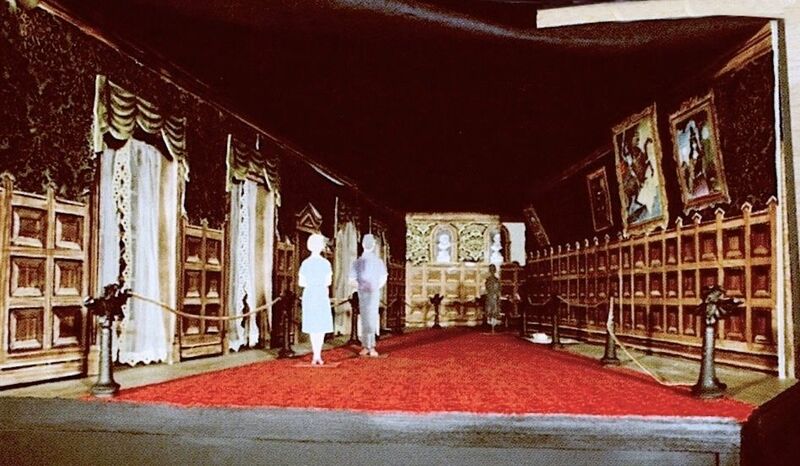 This is the other "real or imagined" game in the Haunted Mansion. There are two. manipulation of the building or are they mental delusions? by the Imagineers or are they ... um ... mental delusions? Hmm. Better make that three games. Are the two dilemmas two dilemmas or are they really only one? In their own weird way, they're like the changing portraits: normal one second but ghostly the next, in this case depending not on electronic illusions but on your mindset and perhaps the angle you look at them. Come to think of it, the staring busts oscillate too. They're normal when you're standing still but ghostly when you move. It's all so beautifully consistent, but what about the wallpaper? When the Imagineers were flipping through samples, don't you think they would have been drawn consciously or unconsciously to designs of the third kind discussed above, the kind that practically plop their hidden faces into your lap? 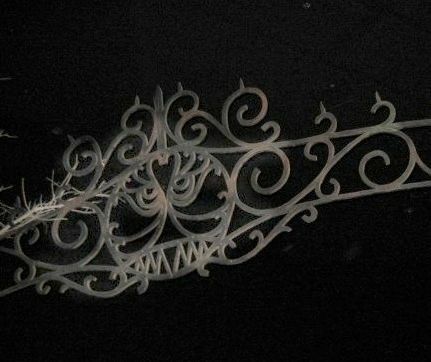 If you saw one of those designs in the Mansion, wouldn't you suspect that the choice was made precisely because that kind of design is starting to do what the COD paper already does? Like the wainscot "skulls" and the coffin tapestry, "found" designs of that nature would go into that murky, "real or imagined" category. When you enter the portrait hall, you begin to really feel like you're being watched. You look down at one end and you see the two busts staring back at you. Most of the flashing paintings have figures looking out at you. Besides all that, there are the bat stantions grinning up at you, and a step below them on the subtlety meter are the "skulls" in the woodwork. Can we go even further? Do we dare? Should it occur to you to look at the walls for faces, they fairly pop right out at you. And heed this warning! Once you see these little devils, you may never be able to unsee them. But that's nothing. Go in a little closer. 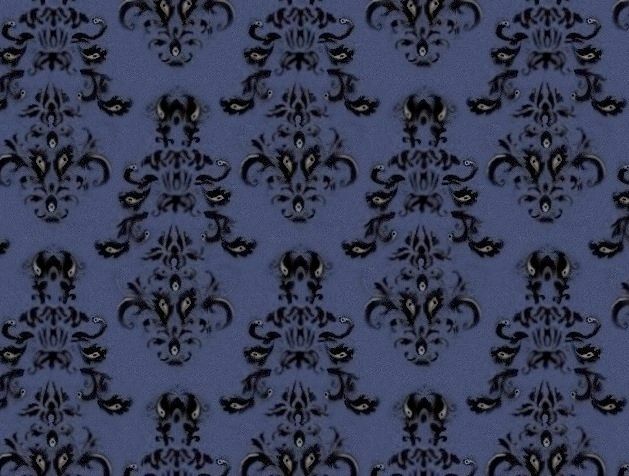 You know, it's ridiculously easy to see faces in this wallpaper pattern, once it occurs to you to look at all. They're almost as obvious as the ones you could see in the third kind of designs we were looking at earlier. 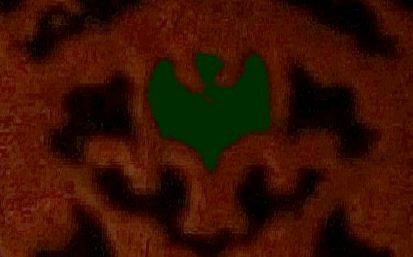 others if you try), there's a smaller face, parked right there on the Sith/Skull's forehead. me of the gargoyles carved on the ends of the coffin upstairs. What's that parked on HIS forehead? Ummmm....nope. Nothing on the bat's forehead. Further than this we cannot go. Somewhere between the busts and the bat, we obviously passed over a line, and I think I know where that line is, but ... I'm not absolutely sure. Just as the paintings down here certainly flash back and forth between normal and ghostly, and just as the busts are natural when you're still and supernatural when you're moving, and just as the "skulls" in the woodwork down here may oscillate in your perception between abstract designs and death's heads, so also this paper design may have been chosen (consciously or unconsciously) because it lends itself so easily to the same sort of oscillation at an even more subtle level, playing off of a near-universal psychological experience often associated with childhood fears. 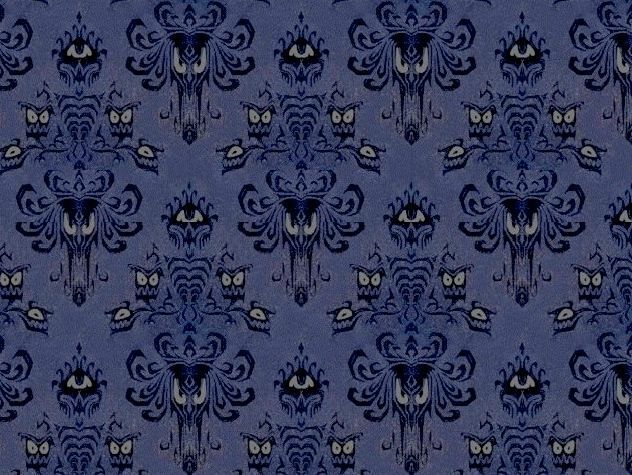 Hey, we have the demon-eye wallpaper upstairs as proof that they were aware of and exploited exactly that psychological tendency, so who knows? Here I am doing a major update, practically before the ink is dry . . . no, wait, practically before the electrons have settled down on the original post. 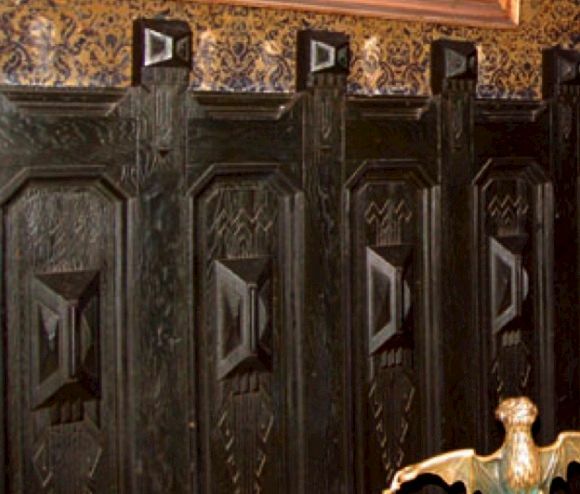 First off, I want you to try to unthink and then rethink the wooden figures along the top of the wainscoting. Do they bear a stronger resemblance to skulls, or to something else? Hmm. Notice how well the teeth and eyes line up. "Skulls" indeed. 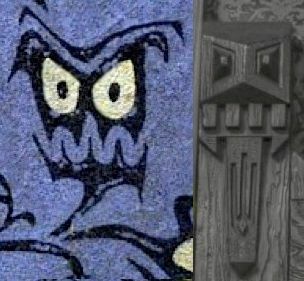 The larger "skull" also features an intriguing similarity to one of the demon-eye characters. Note the "fishhook" designs in the "beard," and the diamond-shaped tip at the bottom. In the models, the woodwork has no facial features. 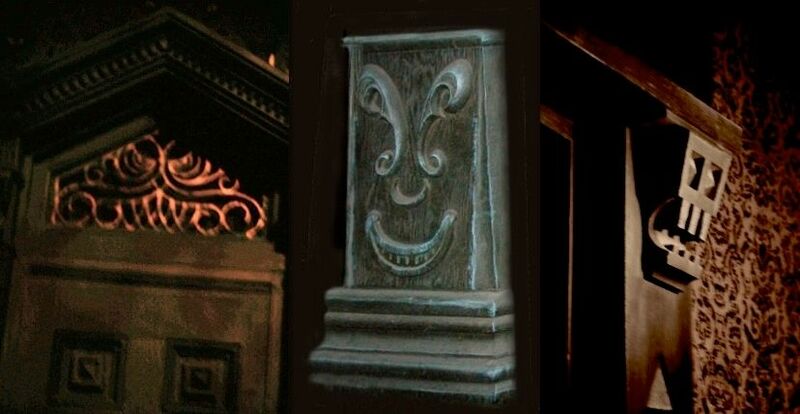 It would be interesting to know if they decided to carve figures into it before or after it was decided not to use it upstairs. I suspect it was before, since the decision not to use it sounds like a pragmatic decision, driven by a shortage of time and/or money. 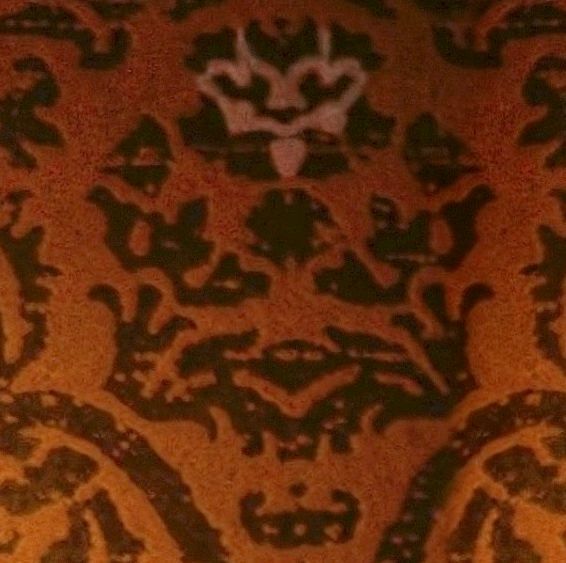 In that case, the "skulls" would have been designed with the expectation that the demon-eye wallpaper would be right above them. Think about the subtle head games involved. 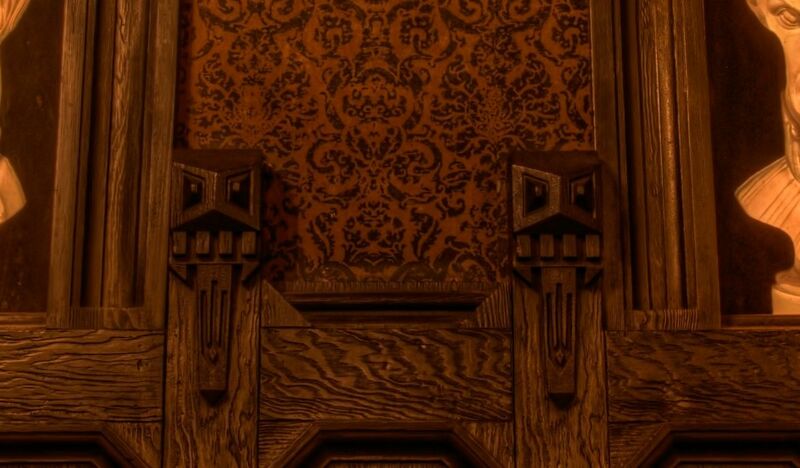 In the Portrait Hall you see these stylized figures in the woodwork, and they're a little creepy, because they look like faces of some sort. 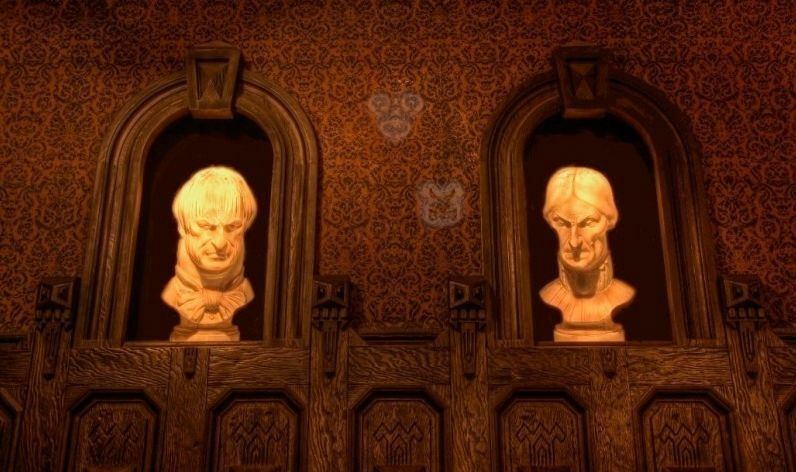 The wallpaper above them will give you faces too if you take a moment to look for them. But you know that those are imaginary, your mind playing the old spontaneous tricks it always does with suggestive patterns of that type. Maybe the geometric designs in the woodwork are nothing more than that? Then when you get upstairs you are shown the same carvings in juxtaposition to impish faces undeniably present in the wallpaper, and those faces are stylistically similar enough to the carvings to confirm absolutely what you may have only suspected downstairs. DIsquieting metamorphosai at every turn. I don't think this was necessarily thought out consciously and discussed. 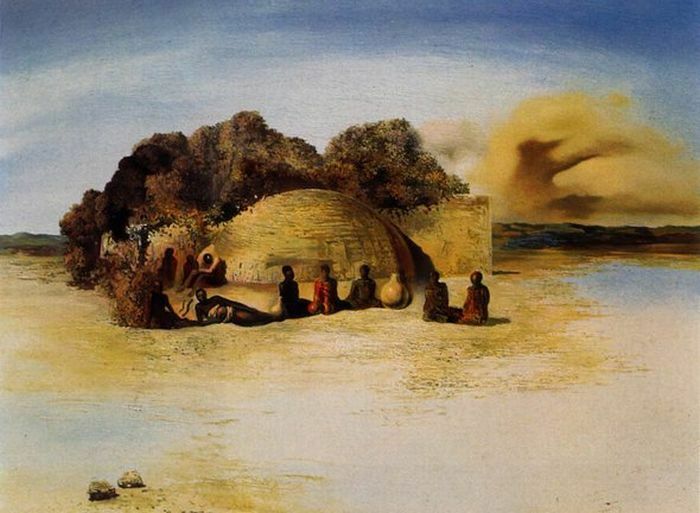 I think it could have been imagineered by artistic instinct alone. Whatever the truth is, "skulls" shall forevermore be in skeptical quotation marks around here when those carved features are mentioned. 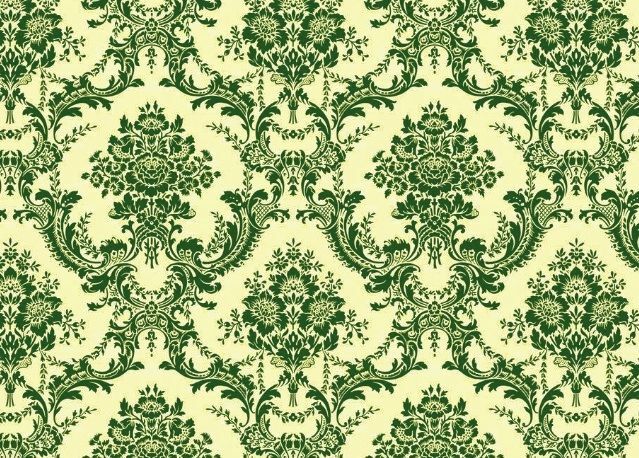 If we're going to go mad and start seeing things in ordinary wallpaper, like the protagonist in Gilman's novella, then it may as well be yellow, like hers. We've discussed before the wallpaper upstairs, around the Endless Hallway (formerly there in WDW, still there in DL and Tokyo). 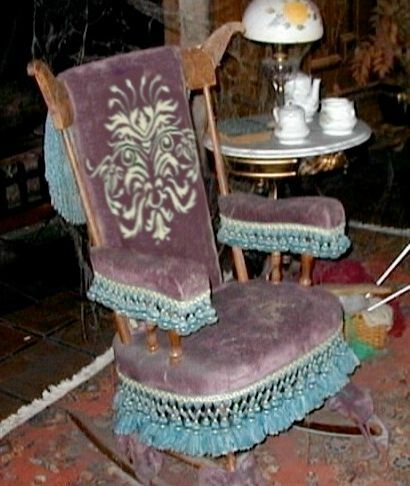 I'm wondering now whether the face in the chair upholstery may serve as an open invitation to the viewer to look at the walls behind it for hidden faces as well. That hypothesis looks better when we remember how this area was originally scripted. 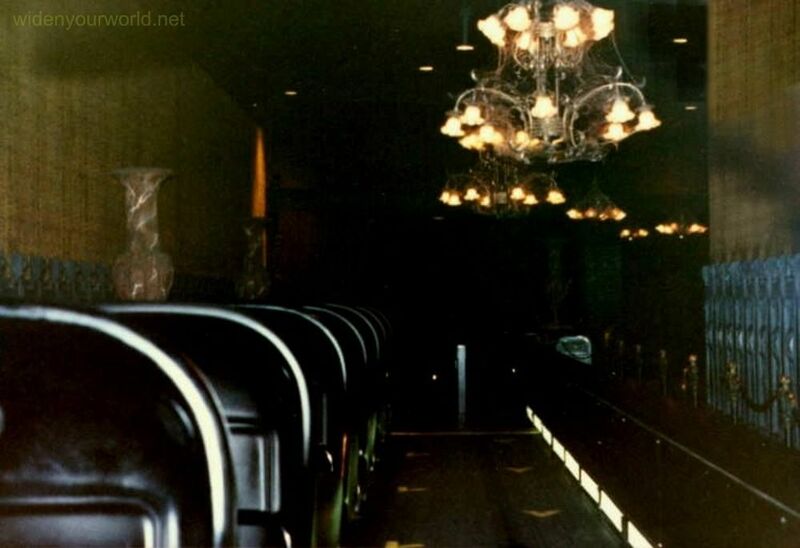 You will recall from that earlier post that the Imagineers presumed a movement of guests past all of it at a much slower rate, a presumption made obsolete by the doombuggy, resulting in a last minute rewrite of the entire scene. be that my king and bishop are not quite so random and subjective as I thought. Before we wind it up, I want to take a quick look over at the WDW Mansion. yellow wallpaper that DL and Tokyo still use around the Endless Hallway. Early on this was replaced with a red and white paper that lasted a very long time. 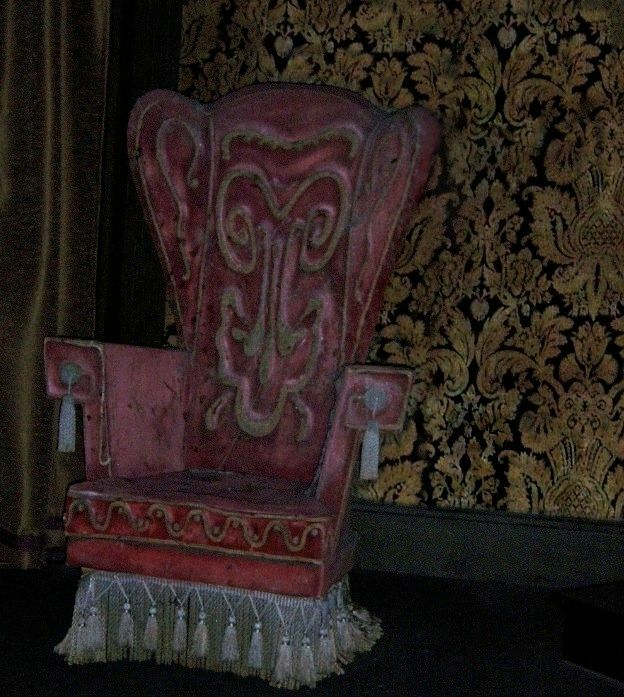 It's not the target-rich environment you find in the portrait hall at Disneyland, but still, it takes little imagination to see a face right there. I like it for two reasons. First, the "chin" is an uncharacteristically angry Tigger. I guess a Tigger is not always such a wonderful thing. 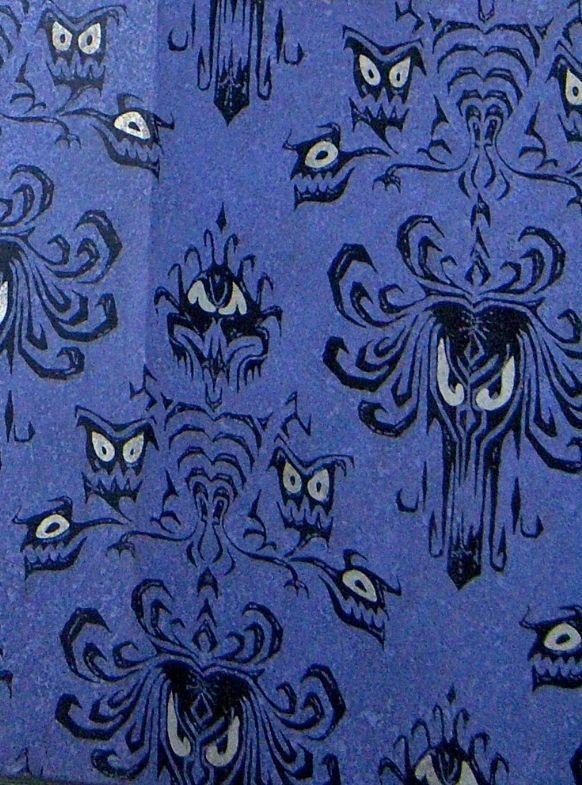 Second, whether by design or by accident (probably the latter), it reminds me of more sinister wallpaper yet to come. new paper is rich and beautiful, no question about it. Enough. Enough! This is getting out of hand. Maybe I've been staring at these wallpaper designs too long. A year from now I may look back here at the silliest post I've yet written. One thing I am sure of is that the Imagineers made selections and drew up designs that were purposely intended to lead our imaginations into a limbo where you have difficulty separating the real from the imagined, the deliberate from the accidental. I'm afraid the Ghost Host may not be the only one taunting us. Now if you all will excuse me, I'm going back under my blankets, where it's safe. Where you see a king, I see... OMG, it's Duffy the Disney Bear! 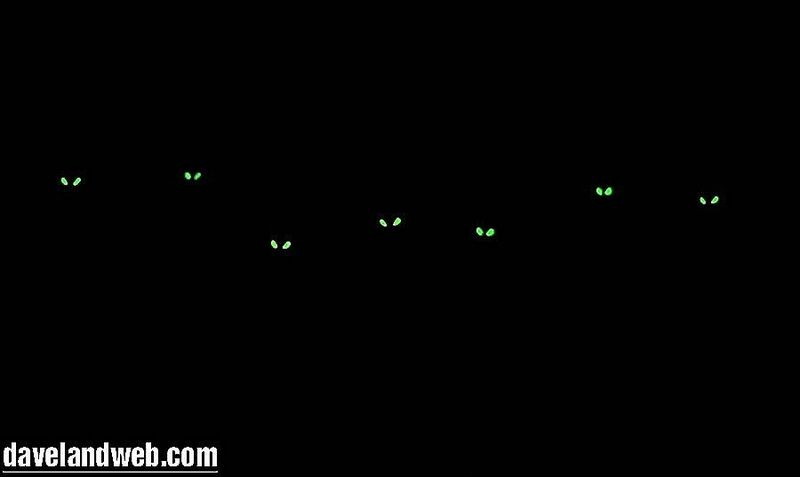 I feel like the glowing eyes in the WDW wallpaper are overkill. 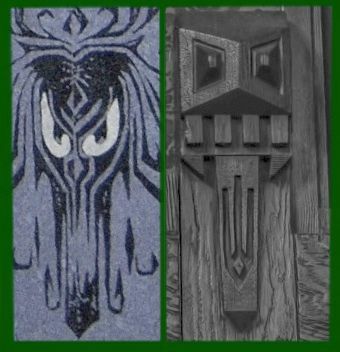 I like that the Anaheim Mansion trusts us to be paranoid enough to see the faces on our own. Good post. That first animated .gif really scared the bejeepers outta me! 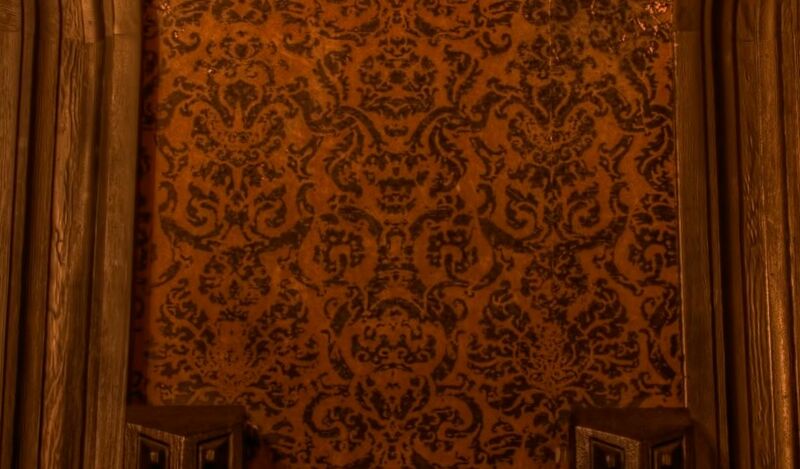 One place I *don't* see faces is in the original yellow wallpaper. 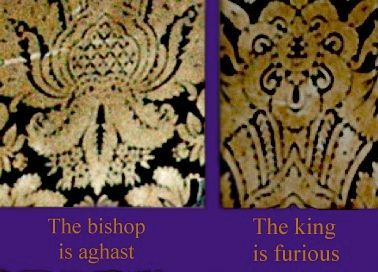 Well, not human faces: I see a cat face, and a fish with elaborate fins, and the "Bishop's" hat is a pineapple to me. We could probably go all day picking out things we see in the various wallpapers. 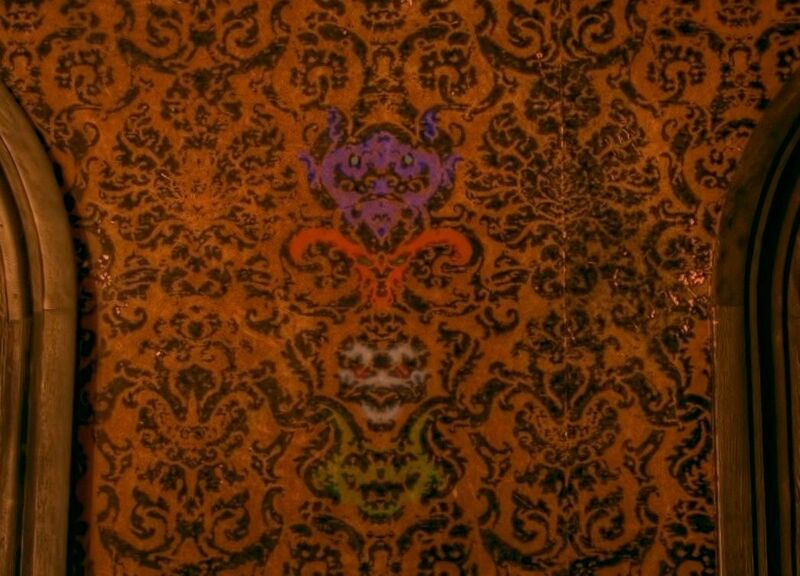 I think this is why I've never cared for wallpaper in normal houses: it's either an eyesore or you start questioning your sanity when you start seeing faces. I took a picture of the wallpaper at my last house's powder room which had clownish "faces" and the one in my current home has flower petals that resemble "skulls." Thankfully, my own room's walls have no wallpaper. Great post. I was always curious about where the rest of the 999 were: they've been watching us the whole time! 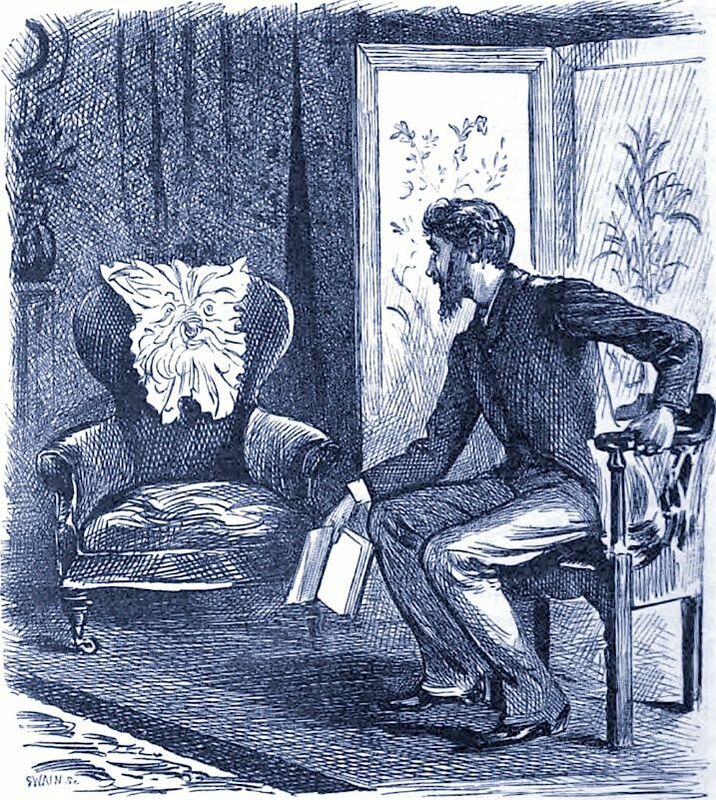 The psychology at play is so compelling, and your zinger is perfect: "I'm afraid the Ghost Host may not be the only one taunting us." You take optical illusions straight to the optic nerve. I know when I stopped breathing as I read your piece: when you made the connection to Charlotte Perkins Gilman's "The Yellow Wallpaper." Thanks, folks. But this is nothing: just wait until you see my post about the Mansion's window putty! I'm already adding a small update, just one day after posting. It's in bright yellow, you can't miss it. 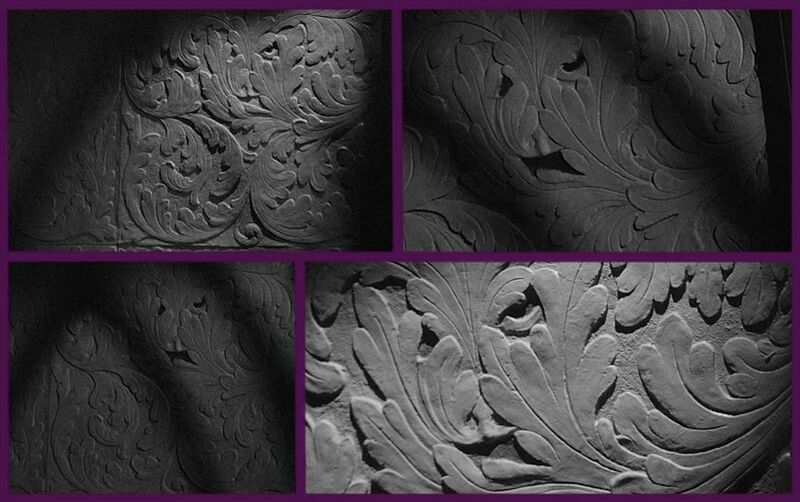 I actually see three separate ominous faces in the top right hand b&w damask pattern from the first group which you say would be okay in a nursery. I'm glad that stuff wasn't in my room when I was a kid! Spooks come out with a tube of caulk. 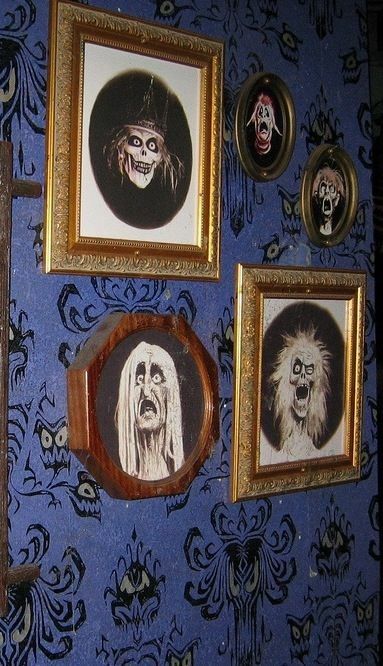 Grim, grinning ghosts come out to weatherize! 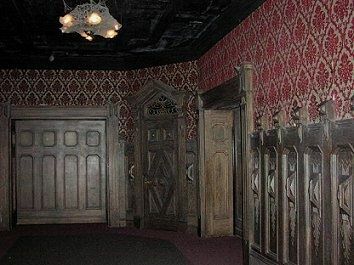 This brings back memories of working as a tour guide at the Winchester Mystery House in the early 1980's...there was a "devil's face" in the Lincrusta wallcovering design in Sarah Winchester's bedroom that we guides liked to point out to each other (but not to the tourists). Curiously, it was not repeated all over in the pattern, it was just in one spot! It was creepy! I've actually heard that place cited as an inspiration for the interior of the HM. Jack, yep, no doubt they're there. And as soon as the lights go out, they're gonna GITCHA. That's why I say stick with Kermit and bunnies for the nursery. Melissa, that was paneful. Made me shutter. GGGCOTS, I live about 15 minutes away from the Winch House, but I haven't been there for...well, I don't want to say how long. I really should go again. i enjoyed this immensely! 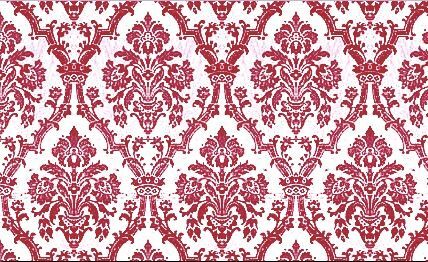 i love damask because i spent long hours in my great grandmother's house finding faces in the wallpaper when i was a kid! 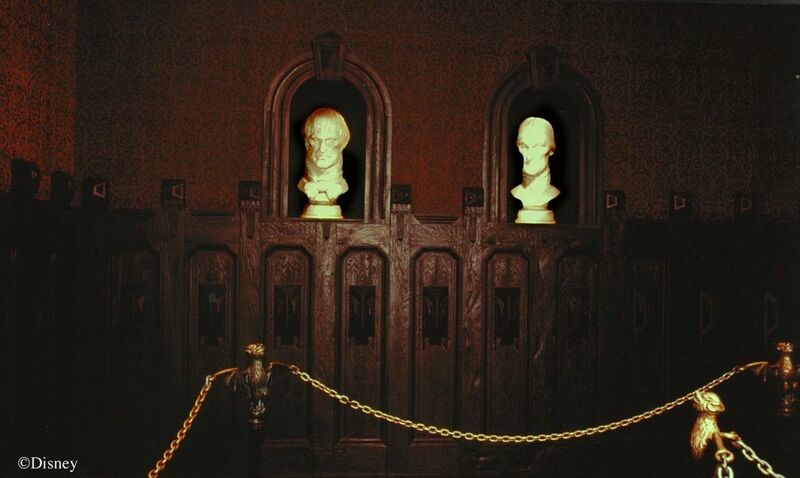 i also love that the wall itself that houses the busts sort of looks like a skull with the arches making the eyes. so many layers! Interesting post as always. I'm surprised you didn't mention pareidolia, the psychological phenomonon often cited as the reason people see things like the Virgin Mary on their grilled-cheese sandwiches. Thanks for the word, which wasn't in my vocabulary. Actually I was going to go into the "Virgin Mary in the coffee stain" phenomenon, and I had some fun pix in the file ready to go, but in the end I figured the topic would just keep going and going if we went there, so I left that stuff out. But you're right, it certainly is germane to the topic. Love wallpaper--old-time wallpaper. Like with Farrells Ice Cream Parlor in California (on the comeback), their distinctive red wallpaper is one of their trademark looks. 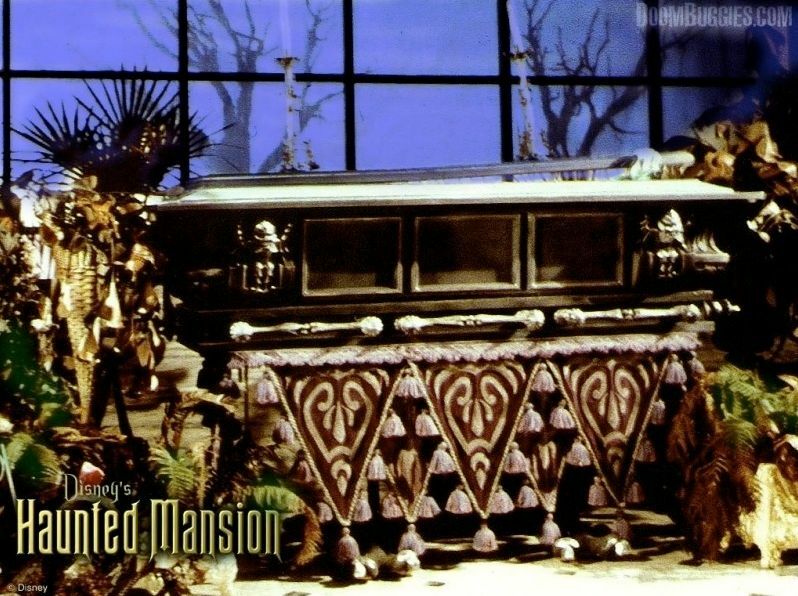 In the Haunted Mansion it works so well to give it an authentic spooky ambiance. Love the attention to detail this site offers. Reminds me of a "Frantics" sketch from their 1980s - "We're the people inside your walls"
I spent as a kid some summers in a wooden cottage without wallpapers... and boy, were there faces all over! The grains of the wood and the knotholes make some excellent faces. You really don't need wallpapers to see faces everywhere. Very good point about wood grains. 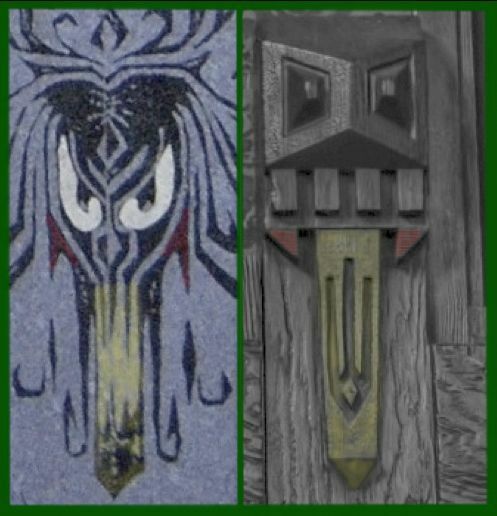 They're at least as full of unbidden faces as wallpaper, with the added feature of being each one being unique (unless it's fake, repeating wood grain). The bathroom door in my first apartment had a pretty good caricature of Pete Townshend in the wood grain, which I still remember vividly while forgetting quite a lot else about the place. Heh. 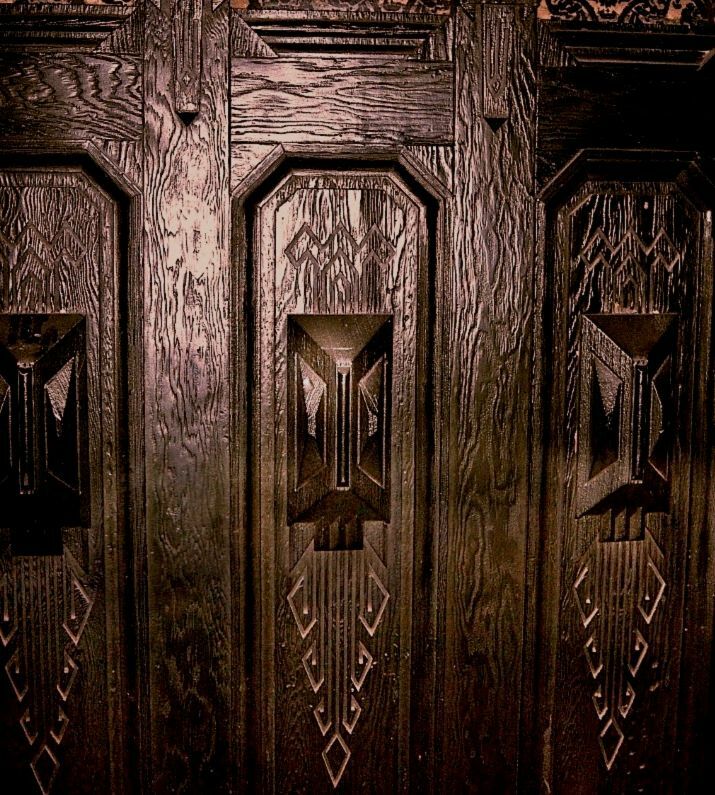 The chicken exit at DL has a typical push-bar door latch on the door leading to the outside (the one in the trench of the queue), and it's got a pair of wizened, disapproving eyes in the wood grain right above the bar. Bwahahaha. The eyes in the dark area of the wall paper before the wall paper comes to light is actually a very easy effect. There are little black boxes with a light inside and theres a film over the box that shape the eyes. They sit on little poles that are on springs that go back and forth because of a fan behind the wall..
A fan *behind* the wall...? That doesn't make a whole lot of sense. Is there a hidden vent somewhere that the air can get through? Or could it simply be the air conditioning? Ditto on the faces in woodwork... There's paneling in the dining room of my house and my family has had many conversations over the dinner table about what we've found... Even some hidden Mickeys!